This stunning wood deck in Kingwood uses the latest engineered wood decking and rails. The owner picked the exact decking color to order. 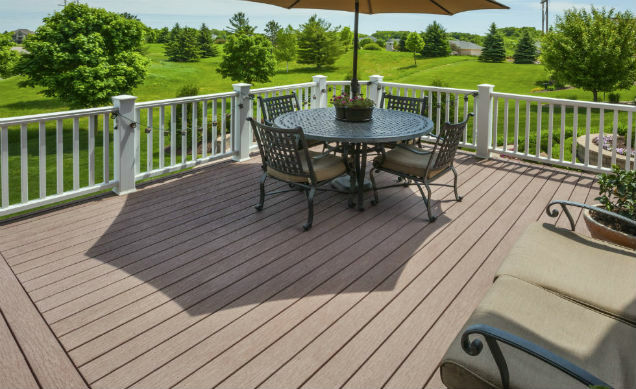 The raills are solid wood decking and all material is guaranteed. As you can see this Kingwood wood deck fits perfectly with the setting. The low rails allow for great viewing and the layout is efficient and inviting. It is important to have a good idea of the king of landscaping you are are going to want before selecting your decking color. As you can see this Kingwood home owner did a fantastic job and loves their new deck!!! Call Houston Outdoor Kitchen Pros for the best priced decks, and a Kingwood wood deck contractor free consultation (832) 409-3542.